Brighton & Hove Albion boss Chirs Hughton praised on loan Leicester City striker Leonardo Ulloa for his goal against Manchester City - but said talks of a possible permanent deal would have to wait until the summer. The Argentine briefly pulled the Seagulls level in their 3-1 defeat against Premier League champions Manchester City this evening. His headed goal in the first half hauled Albion back to 1-1 after Danilo has opened the scoring in record-breaking night for City. Further goals from Bernardo Silva and Fernandiho saw the champions secure the two points they required to set a Premier League record tally for a single season, eclipsing the 95 earned by Chelsea in 2004-05. And also break the league record of total goals scored in a season, netting the two they needed to overtake Chelsea's 2009-10 total of 103. It was also a long-awaited evening for Ulloa, who has found game-time limited since returning from the Foxes three and a half years after leaving the Amex, as he net his first Premier League goal since December 2016. Hughton was complimentary of the 31-year-old's patience this term, having been in the shadow of top-scorer Glenn Murray, but remained coy on what the future held. The Albion boss said: "I was very pleased for him. I think what he has showed, while it has been difficult for him as Glenn has played the majority of games and you get into a rhythm. 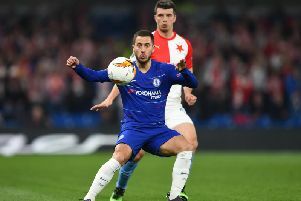 "It's very difficult when you have not perhaps played as many games and he did look a bit rusty at the start of the game, but he improved as it went on with a bit of confidence. "I am really pleased for him to get the goal and overall his performance deserved it." On the striker's future and whether Albion could try and land him again on a permanent basis, Hughton added: "It's something for the summer. We have him on loan at this moment, he is still Leicester player. He will come into our thoughts, but we had a lot of decisions to make in the summer." On the match itself, Hughton said: "It's good experience for us and we are learning more about these players every game. You always go home thinking you could have done more. "I think probably the area of disappointment was that, for the bulk of possession Man City are always going to have, they were not great goals that we conceded. The first two we allowed ourselves to be opened up and the third was from a corner where we should have done better. "That would be my only disappointment from the goals we conceded. Overall, with regards to the way they play and the bulk of possession they always have, there were lots of aspects of the game that I was pleased with. "It was a tough evening but probably nothing short of what we expected. I was really delighted to get back in the game at 1-1 and they showed a quality to go 2-1 up. "For the the bulk of possession they had, the game wasn't too different to what I though, but at 2-1 we were still in it and we had good opportunities at time to break. What they do it close down the ball so quickly and it's very difficult. "The third goal - which was a poor goal to concede - proabably hurts us the most."